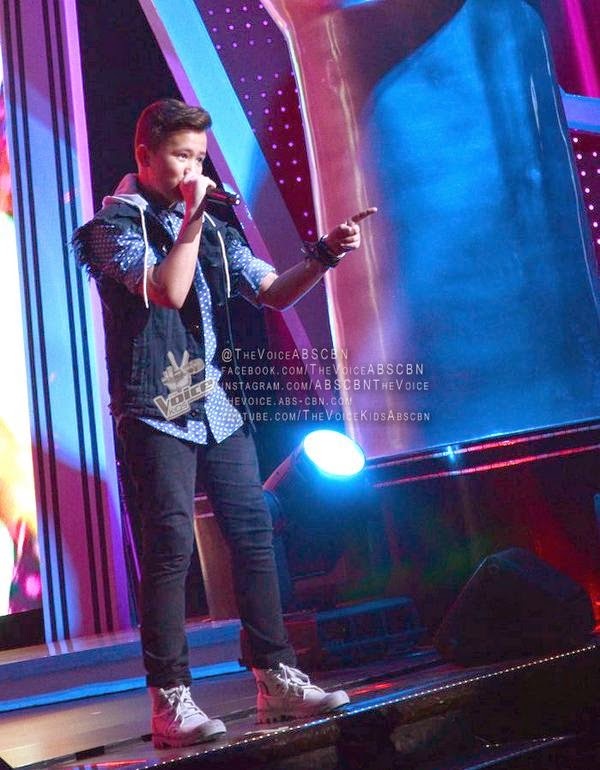 Manila, Philippines - Team Bamboo's young artist Juan Karlos Labajo sang The Beatle's "Yesterday" during the grand finale's power ballad round of of ABS-CBN's top-rating singing competition 'The Voice Kids' Philippines on Saturday, July 26, 2014 at the Resorts World Manila, Newport City, Pasay City. The 13-year old kid from Cebu City dubbed as 'Cebuano Charmer' is among the Final 4 artists the competition under Team Bamboo. Juan Karlos became emotional before the end of his performance because of his mother who passed away last year. WATCH: The Voice Kids Philippines Grand Finals Power Ballad Round "Yesterday" by Juan Karlos Labajo (video). Aside from JK, other artists aiming for the title are Team Lea's Darlene Vibares and Team Sarah’s Lyca Gairanod and Darren Espanto. The finale episode on Saturday tops online conversations with '#TheVoiceKidsFinale', 'Go Juan Karlos' and '#TVKDarrenUltimateTotalPerformer' among the trending topics.